In the fitness industry, there are a lot of buzzwords used to make something sound really new and innovative, or sound really bad to help the consumer believe in their product or services. The word I wanted to help define from a Muscle Activation Fitness mindset is “compensate” or “compensating.” Webster’s dictionary defines compensate as “to counterbalance, to adjust so as to offset or counterbalance variations to or produce equilibrium.” To help define compensation for our discussion in this article, compensation will relate to not ideal or efficient posture and/or muscular performance. The Good. How can bad posture and poor muscular performance be a good thing when most programs are tying to get rid of a person’s compensations? I did not say that compensating was ideal or the best thing for the body. Compensation is absolutely necessary by our bodies so we can be productive human beings. If we did not compensate, we would all be in wheel chairs and dead at a very early age. We were designed in a way so that we could go about our daily lives and get around even in the face of major compensations. Utilizing Muscle Activation Techniques and a personalized exercise program, we can offer the body more solutions to maintain and achieve this equilibrium. The more solutions to a problem the body has, the less tight and overworked the body will feel. The Bad. 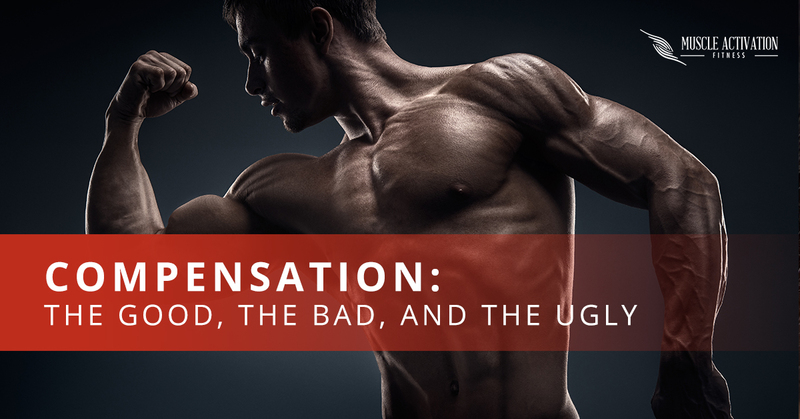 As we grow older, these compensations have an impact on our bodies. For the most part (barring a disease like cancer), our quality of life is dependent on the health of our joints. The more flexibility and loose someone feels is usually a good indicator of good joint health. If we have poor functioning muscles, our bones will start to crash into them selves with more and more force that eventually starts to wear them down, and we can change our posture to accommodate the compensations. This is where we can start to feel those irritations like tendinitis in many different places. The Ugly. If we do nothing to address a poorly functioning muscular system and stay active, then we will eventually come to a point where our body can no longer compensate and it will let us know by increasing inflammation and pain to where we have to slow down and keep decreasing our physical activity and quality of life. The unfortunate thing for some who get to this point is that there is no other solution other than surgery or replacement of the joint. The Alternate Road. The best way to try and prevent or slow down the bad and ugly from happening is to find and address these compensations. This is one of the top priorities of the Muscle Activation Fitness team! If the compensations can be found and systematically improved, the chances of higher quality of life as one ages dramatically improves. Remember, pain is your body telling you that something is not working as it should be working. Even if you are not in pain, it is still a good idea to have an assessment done frequently to make sure that compensations are not building. Just like we take our cars in to get them serviced to limit the wear and tear on the vehicle, the same can be done for our bodies via assessment and implementing proper training progressions.